This book is the catalogue of the exhibition entitled "Winter Garden: The Exploration of the Micropop Imagination in Contemporary Japanese Art." The exhibition was planned by the Japan Foundation and curated by art critic Midori Matsui to introduce a new generation of contemporary Japanese artists to the world. It will be traveling all over the world for next five to ten years. 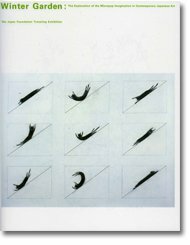 The catalogue consists of images of all the exhibited works--35 drawings, paintings, and video works by 14 artists--and text written by Ms. Matsui. She coined the word Micropop to describe the mindset of the new generation of Japanese artists born in the late 1960s or after, who rearrange fragments of information and knowledge to suggest fresh ways of perceiving the world or give new meanings to the outmoded and banal. In the catalogue, she explained this new viewpoint using a lot of examples and images. The catalogue also contains wonderful installation views of the exhibition held at the Hara Museum of Contemporary Art from June to July, 2009. The catalogue is written in both English and Japanese and is available at Library.